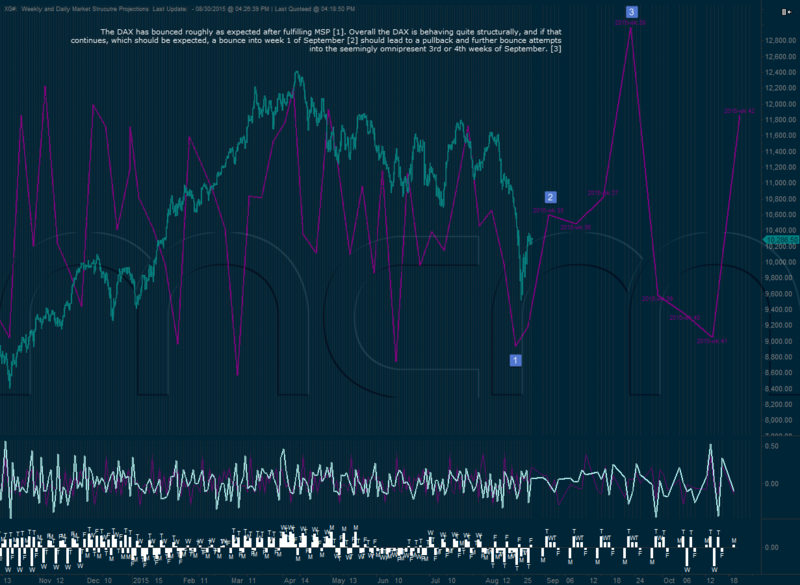 The MCM indexes are a proprietary product which indicates not only the emotional state of the markets (via the accumulation index), but also the most important components: the dollars added to the market, the stock share directionality and rich vs. cheap tickets. All these provide important information into the internals of the market and whether the action is healthy or there is reason for a more defensive stance. The basic way to use it is whether the AI and it’s components are confirming the price action or not. So in an up day, the AI should be cyan and going up, the cash added should be positive (the higher the better), directionality green and rising and also more rich tickets than cheap ones. However there are also more subtle signals, which one can rely upon for short term direction. Below is a good example of such signals. We can see that on the 8th of October, the market started with quite weak internals. AI was magenta (meaning negative), cash added was negative (although close to 0), directionality negative and rich vs. cheap tickets also negative. Right until point “A” the price action was choppy, cash added was also choppy and close to 0, however AI, directionality and rich vs cheap tickets were all trending up. At point “A” the price in the market tested the lows of the day, cash added tested 0 too, but AI was still trending up and nowhere close to the lows from the beginning of the day, while directionality was also positive putting in a higher low, rich tickets being more positive too. Market rebounded, but came again close to retesting the lows of the day at point “B”. 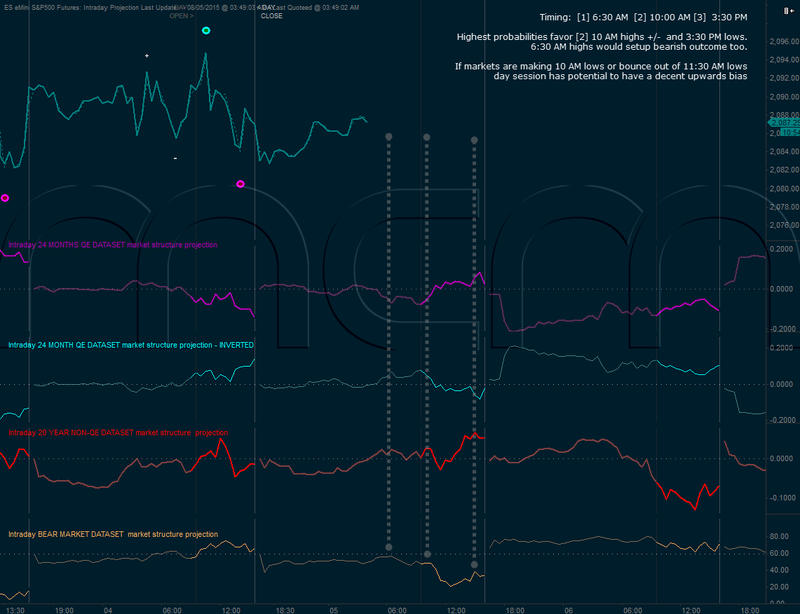 At this point AI was already cyan (showing positive emotion) and with the uptrend quite clearly shown; cash added was positive, went a bit down, but never tested 0, directionality was also in clear uptrend, putting in a higher low; rich tickets had a minimum of the day. After this point, the market never looked back and proceeded to finish very strong. 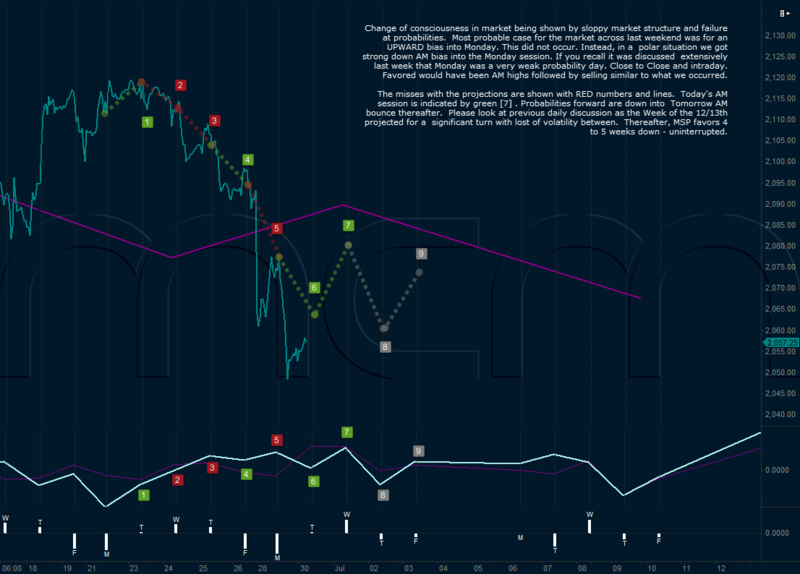 AI and its components confirmed the price action and the day became more of a trend day. The next day, on the 9th, the market opened strong rallying from the open, however the AI and its components were showing that there is something amiss. Cash added was quite low, the AI itself didn’t turn up to follow the price action, being more flat than uptrending. When the decline happened around 10:00am, cash added went to 0 and slightly below, directionality took a nose dive and tested 0 also, and rich tickets were negative as well. After that the market tried to stage a rebound, AI started to trend up and had quite an impressive upward movement, however this was not confirmed by the AI components, especially cash added to the market which remained subdued and close to 0. Point “C” highlights the fact that although AI was cyan (positive) and trending up, the cash added to market turned negative and remained that way. This is a sign that market participants are optimistic and trying to buy the market, however overall money is being withdrawn which means big players are selling into the optimism. This battle finished on that day as undecided, and the effect was a very choppy market which was not able to move much up or down. It has to be mentioned though that when cash added to the market is negative, that usually trumps the AI, and it could have very well ended with a big down day, if cash would’ve started to accelerate in the negative territory. The VIX is a very dubious measure of emotion. Firstly, it is subject to intense manipulation. Secondly, it only reflects panic on drops. Thirdly, euphoric behavior or panic at tops is not reflected or reliable in any form. For these reasons, mcm eMotion and market fact analysis tools are much more insightful and reliable. 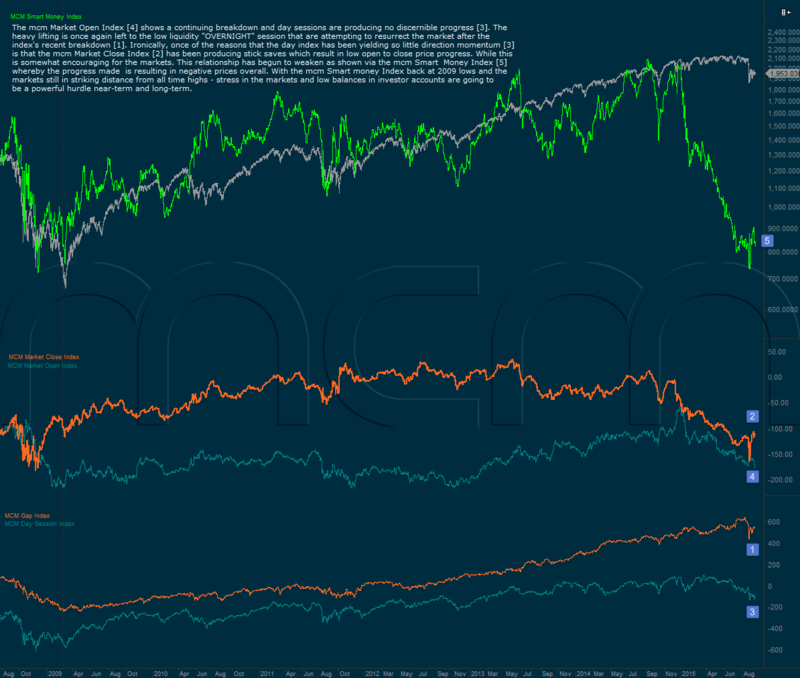 What we can see from the chart below is that the markets are in frail shape and still bullish biased (via orange running cash inflow/outflow) - likely to the detriment of those bulls over the short to near-term. Signs of underlying bullishness will likely fight a good fight and remain as markets drop in the future. However, downside breakouts of emotion triggered hard well before the August weakness as can be seen below . Ironically, emotional commitment on this bounce as well as commitment via funds being allocated to equities are mediocre to average at best...also, shown below [3 and 5]. While people may want to assume that the August drop was capitulatory, share directionality  and cash withdrawn from markets on daily basis  certainly reflect that illusion. These are in fact, more than likely breakouts and signs of much more to come. The reasons for this is the comparative low emotional fear and panic at the recent lows and the low eMotion and commitment to the current bounce. Note the nearing breakdown below 2009 lows of the mcm Smart-Money Index, the mcm Market Open Index and the mcm Market Close Index. Given the nature of these indexes, they suggest low balances in investor accounts and thus high leverage in the markets and a breakdown could cause dramatic stresses on the markets system as well as the financial system in general. Our webinar, proposed earlier in the week, has been scheduled as per the vote results. We would like to thank all who have voted and helped us identify the best time for the majority of all. The webinar will be recorded and a recording may be available after the event. The webinar is Free and does not require any registration, reservation or credit cards. The objective of the webinar is to discuss details regarding identifying and understanding impulse cycles and eMotional Extremes impulses and how these elements can provide a disciplined edge for trading and especially in volatile or crashing markets. We believe these concepts can provide a objective and disciplined approach with which to interface with markets and manage trades generally and especially so, when market activity is aberrant and trade entries are difficult to locate, execute and risk manage. Sunday, August 30, 2015, 8:00 PM, Eastern Daylight Time. Today's action is a cause for some special attention. If you read these pages you will no doubt be aware that we have presented a scenario for analysis purposes that has been accurate, timely and disciplined. Using this approach, we were in front of the sharp rally and the downturn into today. We expected that today would likely be a weak day generally - given the intraday MSP posted this AM and daily flow projection shown on the day-of-week tendency subgraph on the longer-term MSP charts - Thursday's being the strongest close-to-close momentum to the downside. Regardless, downside potential into the afternoon was highly reasonable and additionally a reaction/retracement/bounce would have been entirely reasonable as well and this was not forthcoming. Today, however, did a few things which are quite concerning. We do not change analysis to fit the market, Rather we stick with our discipline and accept the distribution of inaccurate projections and unfulfilled probabilities as valuable feedback and information. That is EXACTLY WHAT IS HAPPENING at the present. 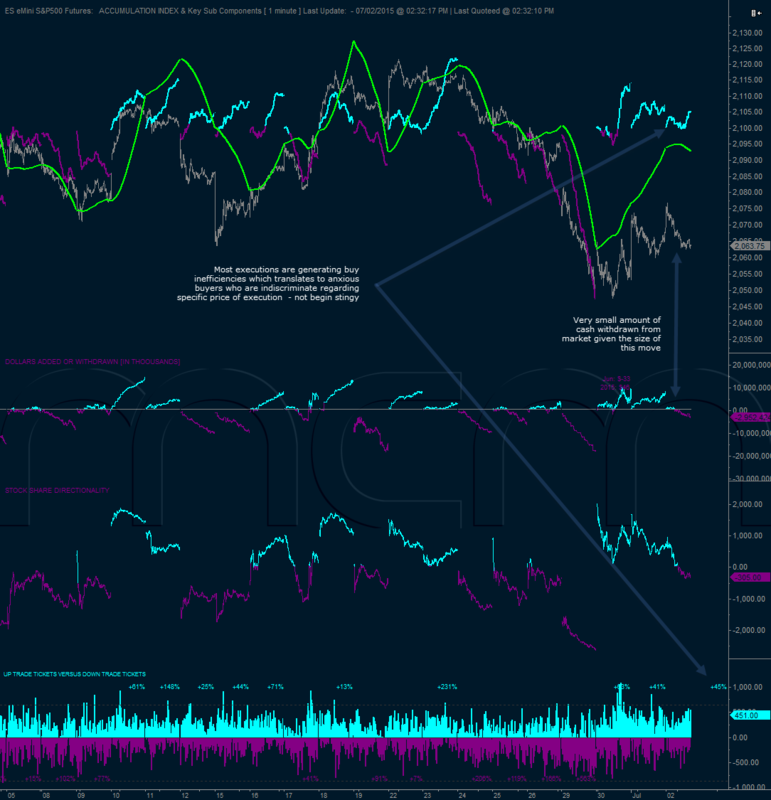 Though the markets are currently on track with our analysis and we still expect a bounce in the near-term into early September, there were key deviations and issues with today's reflections of market consciousness via our tools that deserve some special discussion. You may hear us refer to "X-TICK" triggers. X-TICK's are rankings of ultra high emotional exertions by market participants to sell/buy as a part of capitulatory extreme behavior. 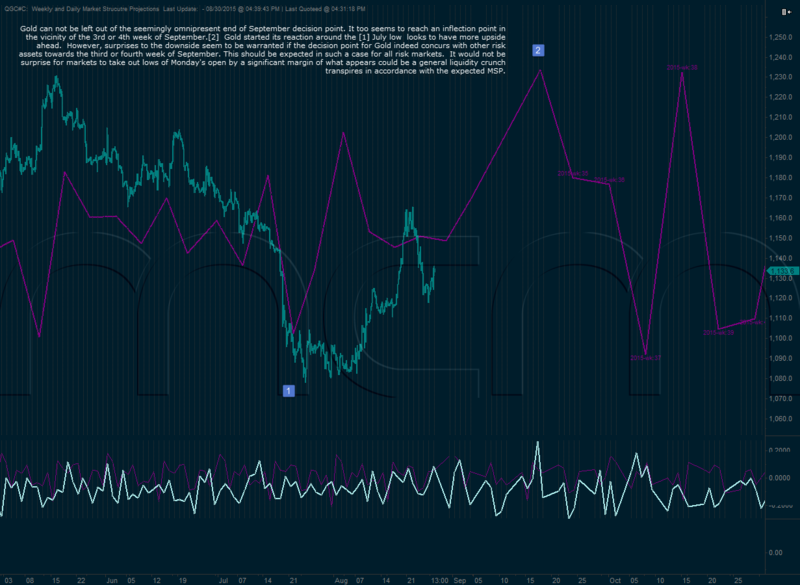 Capitulation in our terms is described in more detail under the eTick-Tools Core Concpets pages. In order to trigger an X-TICK the urge to sell and energy invested has to rank in the top 19% percentile (most of the time higher) of all selling efforts and events over the last 15 to 20 years. As you can imagine this is not an easy thing for the market to do. Today we opened with an X-TICK and got a decent bounce from it of something like 8 or 9 ES futures points. However, the thing with X-TICKS is that professional buyers (or sellers if the market is rising and generating a buy extreme -as the case may be) like to show up and take weak handed contracts when they are made available - X-TICKS are precisely these types of areas. WHEN these professionals then subsequently get run over the X-TICK is broken and it is demonstrating that the market sellers have real conviction. This was expected this morning and occurred. However, this afternoon we got two more X-Ticks that ranking in the top 9% of all selling emotion extremes in the last 15 to 20 years, and though each got a 5 point bounce or so - they were broken subsequently. Additionally, each X-TICK was at a lower and lower price which is a sign that professional buyers with conviction were not shifting the trend and ineffective. Breaking this many X-TICKS in one day is a serious event and a sign to remain alert. This is a sign of increasing risk to the markets capability to stage its reversal. This can not be overstated. Each X-Tick today, being lower than the previous one, indicates a significant capitulation going on among market participants as a whole. This is always something to keep an eye on. First thing this morning we got a reasonable negative GAP TOOLS emotional analysis that suggested that the market had normal probability distribution for a gap fill. In this case, that means: "not that likely but plausible". However, it got a high rank (on the first bar of the cash session when it's analysis is scheduled to trigger) that a breakdown would occur below the opening range. This was a large negative as it is often that such an event can lead to a trend day down. In this case, trending down was expected into the 1;30 to 2:00 pm timing window in the afternoon. There were quite a few reasons that the market was being afforded some room for a bounce this afternoon or in the near-term. Timing, longer-term market structure, convergence of support in the 2044 area (which was pointed out as a possible target for today), a neckline on a very large support shelf that also is a pretty symmetrical head and shoulders pattern and intraday behavioural analysis that would usually score towards some strength showing up this afternoon. As it turns out, the markets ran over these areas after setting up months and months of work above them without even reacting with a small bounce attempt - something reflected in the X-TICK breaches described above. The market had other plans for today. 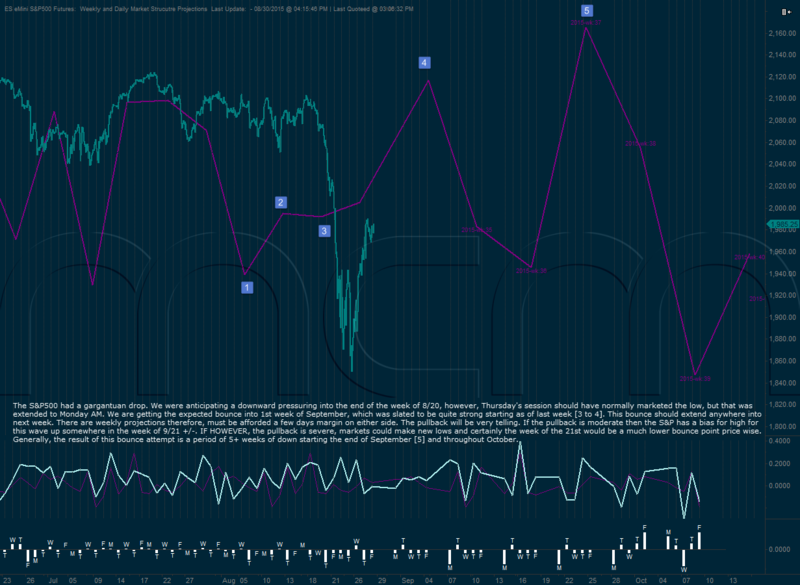 Primary degree support is at 2020.5 to 2010 on the SPX cash and probably is now a magnet before a bounce occurs. One of the things that is very important to understand is that when the market does not follow market structure, as it began to do today, this is often a sign of a change in market consciousness. Market Structure, the way we measure it and define it, is an objective, transparent and unbiased analysis/evaluation of a market within its contextual probability skew. Therefore, when a difference occurs and especially one that is substantial, it is important to take notice. Today's deviation was just minor so far but could get much more if it wants - so, tomorrow and the next few days will help to make things much more clear. Currently this tracking deviation from probabilistic market structure scenarios, is of significant concern, An analogy of this effect if similar to hitting the brake pedal in your car and instead of the car slowing down it speeds up. It's an indication that something is wrong and it's a warning that aberration and risk is increasing. Additionally, we closed below the neckline of the 6-month head and shoulders - breaking through it without even bounce at the 2043.5 SPX Cash area - this is very concerning.currently, the market most likely needs to go lower a bit, probably to the 2020 area and then attempt its bounce - which as mentioned earlier should be expected into early September. September offers an early month high or possibly a higher high around the 21st. Currently, as mentioned in today's AM post, favored is an early month high for the US markets with a lower high retest into the 21st. HOWEVER the capacity for this bounce attempt to be very small or worse to become a running pattern is of significant concern as this could easily lead to a panic. Given how much leverage and risk the Fed and other central banks have infused into the risk markets it is is notable importance how markets react to a bounce attempt into early September. If the bounce if very weak and thin, it would be a good idea to increase power to the flux capacitor and prepare for an emotional and high volatility future. The market has been struggling and chopping around as well as chopping traders up. Yesterday's session generated some emotion - finally. Two X-Ticks set up some key near-term psychological levels between 2086 and 2087 on the ES futures. Sustained trade above or below this range is likely significant. Probabilities favor an upward bias overnight into roughly the open, as discussed in the lounge. The overnight session has been tracking. The highest probability is highs into around 10 AM and weakness thereafter. Sustaining a reversal out of 6:30 AM area is more bearish but also tracks the general overnight projections for AM highs. Weakness into 10:00 to 10:30 AM with a bounce would shift probabilities towards strength into the afternoon and decent positive bias for cash session. 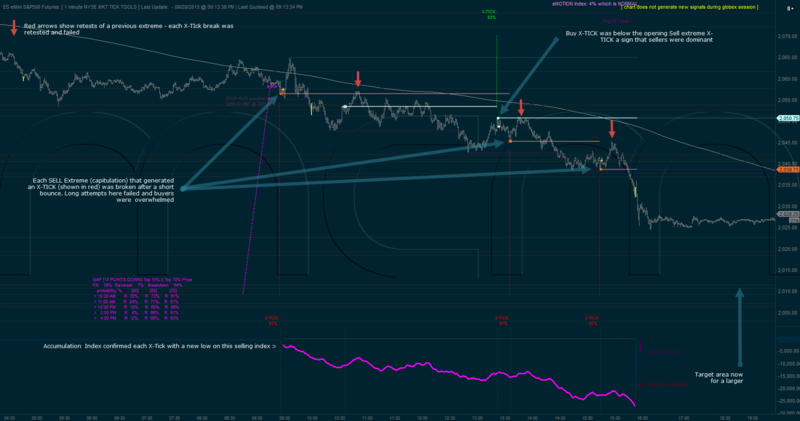 Below is a chart that references the X-Ticks that were discussed in the previous posts. X-Ticks are VERY important events in that they allow a precise measurement and profiling of the energy and emotions being expended in the markets. Today, was a first. Never having traded through a day that generated the single biggest expenditure of BUY energy in all our sample set of the last 15 to 20 years...we got it. The highest amount of BUY energy ever expended in the markets happened today at 2:45 PM. The key with buy energy is that prices MUST stay above that kind of energy expenditure otherwise its aberrant and likely exhaustion/capitulatory. Currently, after hours we just broke the 100% X-Tick at 2068 and immediately dropped 10 ES points. This presents a potentially very serious issue for the markets (Sorry, I mean central bankers) to overcome. Below, for reference, is a historical chart of our proprietary mcm eMotion Index and Accumulation Index plotted for history during of the last years. These indexes offer an unprecedented look into the mind of the markets. The interesting thing about eMotion Index is that is can register very high eMotions near or highs, vastly differently than VIS or other sentiment tools and Accumulation index can show untenable commitment/energy and inefficiency regarding trade quality and executions. The picture is not resolved, but clearly the die is being cast and eMotions are at levels that will likely influence trade for months to come. Why should we expect the markets to make sense. They clearly rarely do. But that is what both makes them predictable and perplexing. 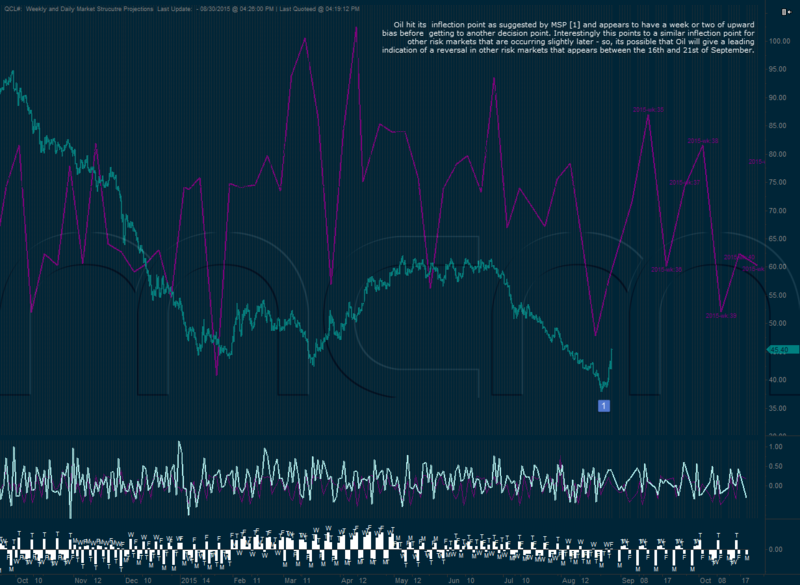 The chart below is showing the mcm Accumulation indexes. 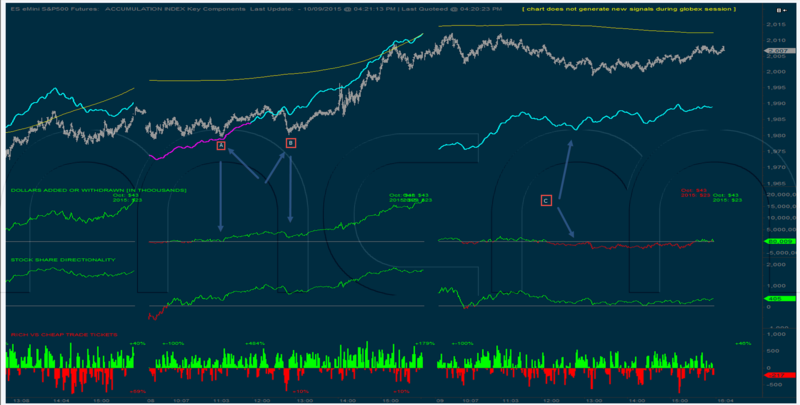 Accumulation Index has been unusually strong (top cyan line) while prices have dropped 20 ES points. Additionally only $2.9 billion has been cashed out of US equities which is comparatively little considering the drop. Normally this number should be something like $12 to 15 billion by now. Not only that Trade tickets executing on the Ask or above are 45% greater than trade tickets executing on the bid or below. While the market is down 20 points!!! Can someone please tell me the name of the central bank panic-buying? Reminds me of IMAGINARY NUMBERS! Lots of cross currents and chop. Increasingly poor/aberrant behavior in markets seems to be pushing us into the 12th to 14th cliff discussed in the longer-term market structure projections. All outcomes point to a combustible situation. One of the things to look for is when markets disconnect from structured behavior as this usually indicates a forced changes to market participant behaviors that later turns into a larger market impact. Recently we have had a few days in which daily directional probabilities were contradicted, they very likely point to this exact type of situation. One note, if one wished to take the time to review posts and articles here, you can see that even on the day's where daily probabilities were contradicted in MOST everycase, intraday probabilities gave that clue very early and clearly. (The Grid View is great for this and has fast search tools keys at the top of the page) Additionally, e-Tick-Tools emotion analysis made even the most difficult days to understand much clearer. Yesterday, for instance, there was an X-Tick on the opening bar indicating buy capitulation. 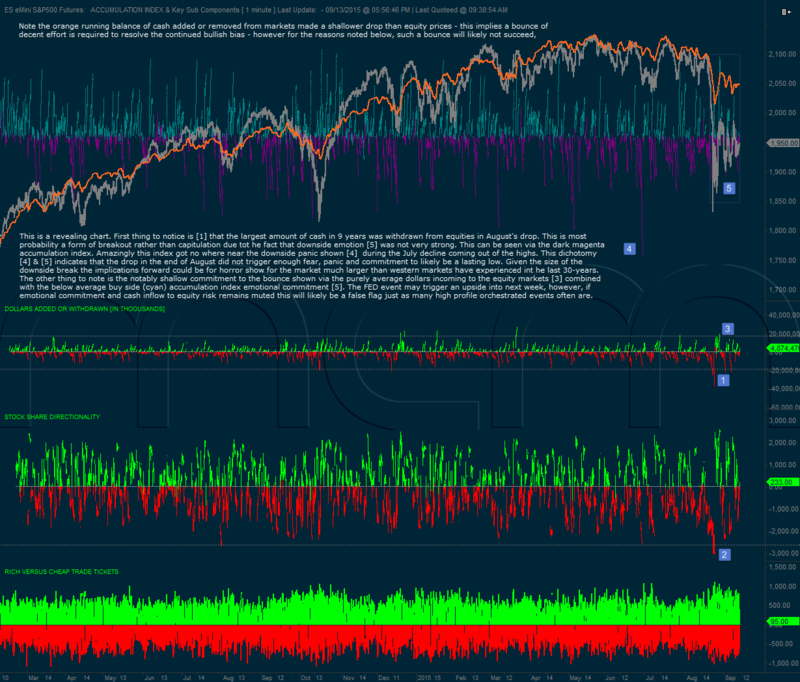 And at the lows there were a cluster of sell extremes and a capitulatory X-Tick at around 2051 and 12:00 PM...and Accumulation Index (also a form of efficiency and emotion analysis) closed at the high of the day...which have so far led nicely to today's follow on upward movement. So far this week, market structure has reverted somewhat as discussed below. Looks like a lot of volatility is on deck into next week with a potentially large move up into the week of the 12th to 14th. Additionally, generally, July 4th weekend puts a pause in things. 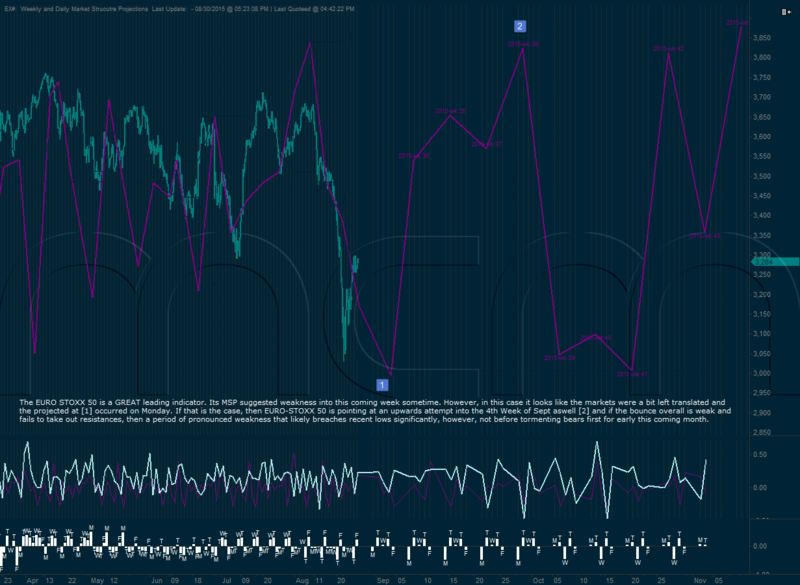 Both this week and next week - momentum peaks on Wed and turns down into the end of the week. This Friday is not projected to be a high volatility day in terms or downside. We will see. Good luck out there and be careful...longer-term timing approaching. Though this is a dangerous market, it's very easy to get overly bearish (or bullish even) and get chopped up.